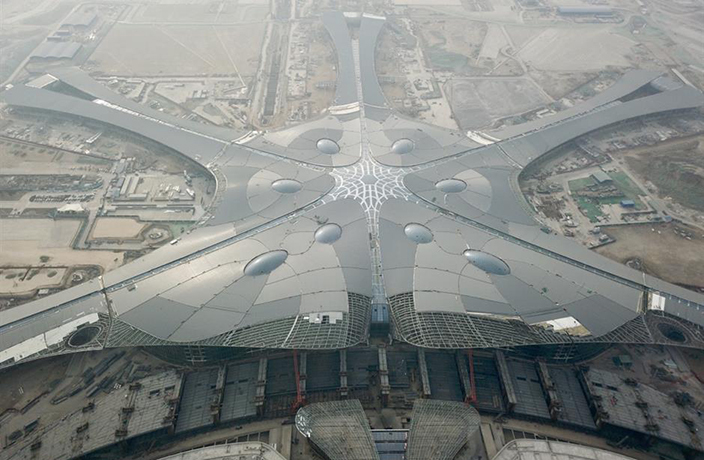 Beijing’s fancy new airport will begin test operations in October 2019, Xinhua reports. Engineering will be completed by July 2019 and testing will begin three months later. Beijing Daxing International Airport (as it has come to be called) is slated to open in 2019. With five wings, four runways and its very own bullet train station, this place is not only going to be big but it will be the largest aviation hub in the world. It is expected that the airport will eventually handle 100 million passengers, 620,000 flights and 4 million tons of cargo and mail each year. In 2016, Beijing Capital International Airport handled 90 million passengers. The new airport will be located 67 km from the current airport. Having an additional major airport in such close proximity is expected to relieve the overcrowding that passengers cope with at Beijing Capital International Airport. The new airport will be connected with downtown Beijing via a series of new highways and freeways, all seven of which are currently under construction and expected to be completed before the airport opens. Construction on the airport began in 2014. It is estimated that the airport will cost USD12.9 billion. That's Beijing – April 2019 Issue Out Now! The April 2019 issue of That's Beijing is out now – paper-and-ink form citywide and also in digital-pdf form. The Beijing Daxing International Airport is set to be surrounded by 17,866 hectares of forest. Construction is entering its final countdown. Hooray! Foreigners with valid Z visas can now use the E-Channel to skip immigration queues at the airport. Find out how to do it.